Hungary has presented plans for its pavilion at Expo Milano 2015. The design for the project, selected through a public competition, reflects the theme of the ‘Universal Exposition: Feeding the Planet, Energy for Life’ and was created by the designers Attila Ertsey, Ágnes Herczeg and Sándor Sárkány. The event was attended by Géza Szőcs, commissioner for the Hungarian government, in the presence of Diana Bracco, commissioner general of Section for the Italian Pavilion; István Manno, consul general of Hungary; and Giuseppe Frattini, designer of the pavilion. Starting from the theme of its participation “From the purest source,” Hungary will demonstrate the importance of nutritious food, a healthy lifestyle and the need to ensure food security and biodiversity for future generations. During the presentation a partnership with the Italian Pavilion was announced, which will be launched during the Universal Exposition. The Pavilion will be on three floors and will occupy a plot of 1,910 square meters. The shapes and materials represent the main lines of Hungarian architecture (the barn, the rural silos and stables) in line with the principles of organic architecture developed in the mid- twentieth century and based on local traditions, encompassing the laws of nature and promoting the relationship between man and the universe. The central area of the Pavilion is inspired by Noah’s Ark, the symbol of salvation of living things. Its two extremities recall the shamanic drums, whose ancient roots highlight the mystical relationship with nature. They bear the ancient engraved symbol of the tree of life through which flows Hungary’s fresh, natural water with its famous thermal properties. Most of the material used for construction is renewable (wood, laminated wood, cellulose) to highlight its eco-friendly and energy-creating content combined in parallel with energy-saving and reduced atmospheric pollution features. It will be possible to dismantle, reconstruct and re-use the entire building. The top floor of the structure will host an open-air garden while in the green area outside the Pavilion will be planted 33 kinds of fruits, vegetables and medicinal herbs. 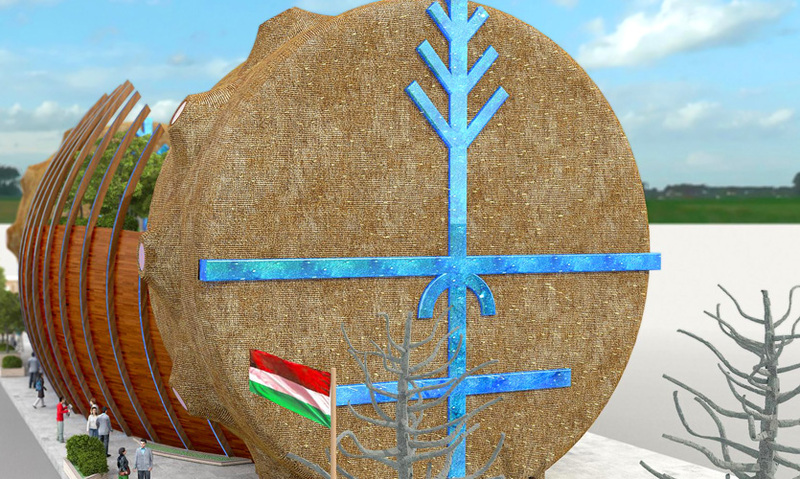 During Expo Milano 2015, the Hungarian Pavilion will organize exhibitions and events with a different focus, such as the Country’s food traditions, historic Italian-Hungarian relations and other themes of contemporary culture.